The unique festive moment of the year for the followers of the lunar calendar has arrived. Last Wednesday the lunar New Year was widely celebrated in many parts of the world, particularly in China. 2015 is the “Year of the Sheep” for China, a year of peaceful coexistence, something that the world dearly needs. On this wonderful celebration, the Chinese Mission to the EU invited Europe to a glorious night to introduce the West to the festive secrets of the East. 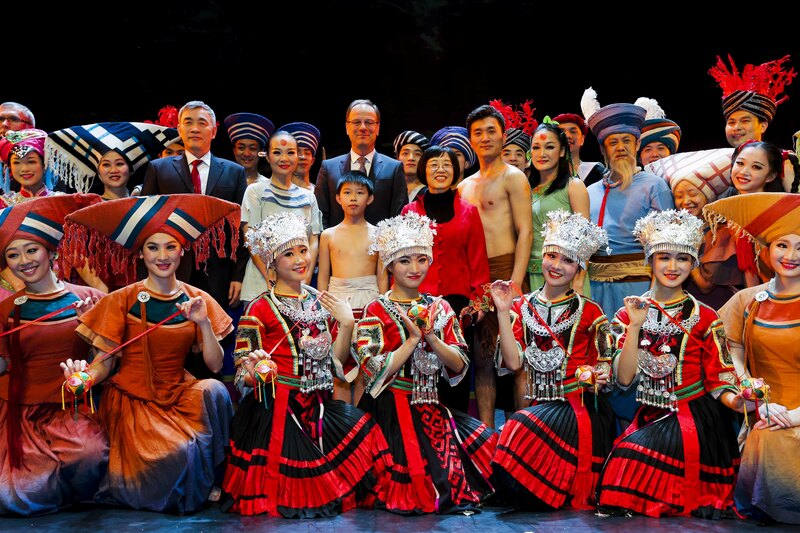 The diplomatic elite of the EU was gathered at the end of last week at Brussels’ National Theatre to attend the opening ceremony of the performing arts show “The Legend of the Sun”, a unique theatrical and dance spectacle coming directly from the heart of China. 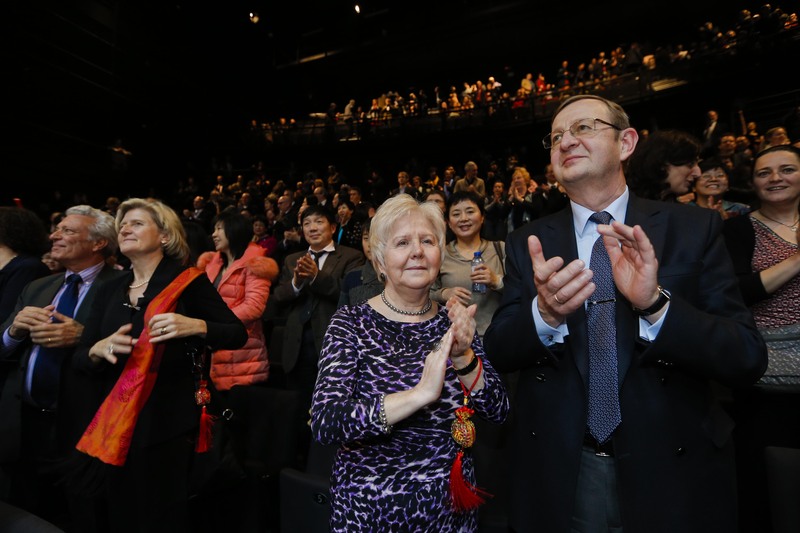 The dance play was introduced by Her Excellence, Yang Yanyi, Ambassador of the Chinese Mission to the EU. The Ambassador not only embarked on a very stimulating introduction to the Chinese dance drama but also referred to the splendid “coincidence” of the China-EU 40 year anniversary: “It so happens that their coming to Brussels coincides with the celebration of the 40th anniversary of diplomatic ties between China and the EU. This occasion of double happiness offers us an excellent opportunity to expand communication and cooperation between our peoples and forge stronger bonds of partnership.” …”I wish to underline here that this dance drama will mark the launching of our celebration of the Chinese New Year as well as the formal launching of celebration of the 40th anniversary of China-EU diplomatic ties.”, Her Excellency continued. Commissioner Tibor Navracsics, responsible for Education, Culture, Youth and Sport who honoured with his presence the occasion, took also the floor to give his welcome remarks. He stressed the importance of the 40th anniversary of the China-EU diplomatic ties; 40 years of excellence and beneficial relations for both sides. Further, he commented on the 2015, The Year of the Sheep, that will be a decisive year for the course of the world from all aspects. 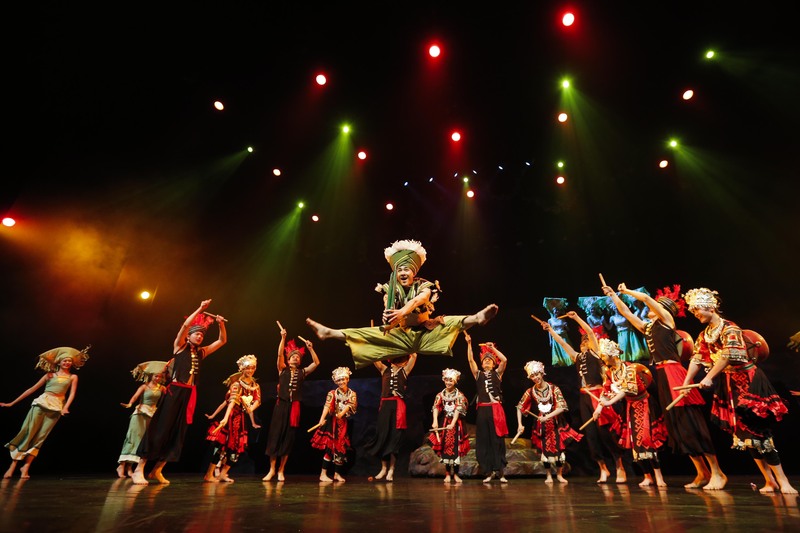 The Legend of the Sun, a dance theatrical play that has won numerous awards, and which filled with excitement and dreams the distinguished audience of the Brussels National Theatre, is an adaptation of an ancient folktale of the Zhuang nationality in Southwest China. The dance play has won the “Golden Lotus Award” of the 2nd China Dance Lotus Award Competition, the “Five No.1 Project Award”, the “Outstanding Production Award” and many more. The story goes back in time following the myth that the ancestors of the Guangxi Zhuang Autonomous Region used to live in a place without sunshine. According to the local ancient story, far away in the horizon there is place where the Sun reigns. People of the local community at the time wanted to set up on a journey to reach the Sun and bring warmth to Zhuang. Initially there was a debate between the local community on who would be the one to take up on this adventurous and dangerous journey in seek of the Sun. Finally it was decided that a pregnant mother, who had offered herself to do so, would be the chosen one to kick off, claiming that “maybe I cannot make it to the end of the sky, but my baby will continue my journey and head towards the Sun”. Amid continuous hardship in the wilderness deep in the forest she gives birth in a few months to her son, “Le”. Unfortunately, however, after years and years of journey, adventure and difficulties, the mother does not endure and passes away. Before she does so though she trusts the holy mission to find the Sun to Le, her son. Alone and lonely Le continues his path until he meets somewhere in the way a beautiful woman, Sister Teng, and falls immediately in love with her. At a festive folksong gathering, Sister Teng calls the young men of the province to compete for her “heart”. Le wins the “battle of wits” and consequently Sister Teng’s heart. However, his deep love for her has made him forget about this mission to find the Sun. He thus one day decides to leave Sister Teng in order to fulfil his promise to his late mother and continue his honourable expedition. Sister Teng could not live without him and also followed Le’s footsteps on his way to the Sun. Amid harsh rain storms Sister Teng soon locates Le. Under all those difficult conditions they both join forces to continue this long quest for the Sun. Inspired by them then thousands of people follow their steps and walk with them towards the Sun. Apparently symbolism during this fantastic dance drama is ample and of great importance for the Chinese but also global culture. The play that we enthusiastically watched last Thursday at Brussels’ National theatre is a symbolism mainly of the long “Odyssey” of humans towards happiness through tough times and struggle. As Her Excellency, the Ambassador of the Chinese Mission to the EU, Mrs Yang Yanyi, elegantly put it during her welcome speech: “this grand dance drama will not only present us the unique blend of various popular dancing, cheerful music and the splendor of the Zhuang ethnic culture, but also Chinese people’s great passion and love for better life as well as their strong resolve and dedication to struggle for it”. All in all, the reception and the inspired top quality Chinese dance drama has been an excellent occasion to celebrate Chinese New Year 2015. It was also an exquisite opportunity to inaugurate the 40th year anniversary of China-EU relations. Given the sheer importance of the cultural and economic bonds of the European Union with China we anticipate the Year of the Sheep to be the most fruitful year to come in the bilateral strategic relations. This is expected to contribute substantially to the prosperity of both countries and also the well being of the state of the world. Happy Chinese New Year 2015 to all from Brussels! « Greece’s last Eurogroup or the beginning of a new solid European Union?